With the rights to certain characters bouncing between Disney and Sony, Marvel at the movies is now all over the place in recent times; their biggest icon Spider-Man was finally handed over to the evergrowing MCU franchise under a mutual agreement following the abrupt end of his failing rebooted series, but now Sony intends to pursue it's own similar shared universe with what rights it has left to try and reach similar success it seems. It all starts with Venom, a standalone antihero flick featuring one of Spidey's most recognizable foes, now starring in his own adventure which certainly hasn't won much acclaim in the eyes of most. 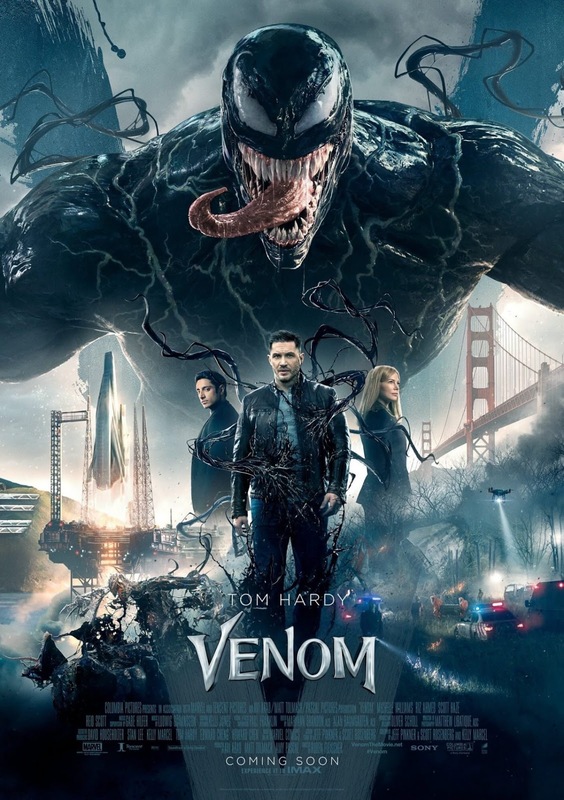 Starring Tom Hardy as washed up journalist Eddie Brock, Venom is essentially an origin story for the titular character in question, involving a number of symbiotic alien lifeforms brought back to Earth by humanity itself in an attempt to colonise other planets due to the apparent decline of our very own; such actions are influenced merely by greed and deranged ambition at the hands of inventor Carlton Drake (Riz Ahmed). What follows on of course is Eddie himself inadvertently tying up with one of said symbiotes and evolving into the monstrous creature Venom itself. 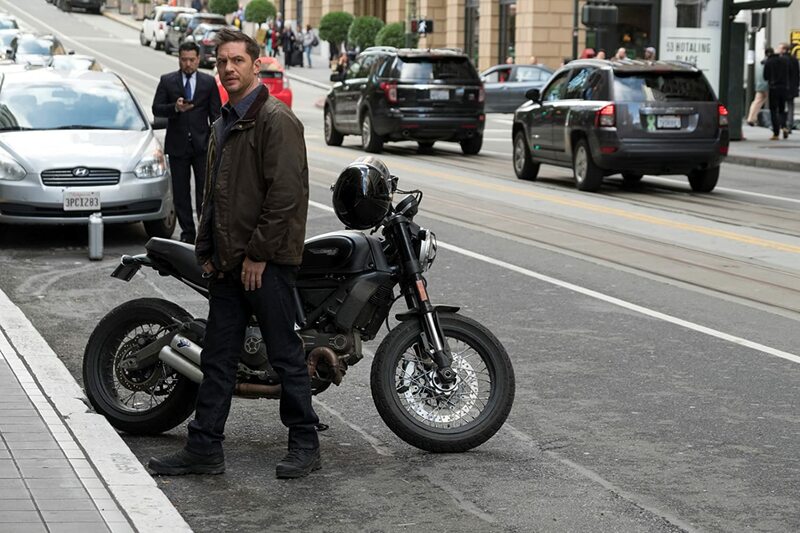 Whilst on paper Venom seems like it has a decent amount of story to add up to an entertaining superhero flick, story ends up being one of its biggest flaws; our introduction to Eddie himself is perhaps one of its most notable flaws as the script rushes through his initial development, including his failed relationship with Anne Weying (Michelle Williams) and the loss of his initially successful career. This isn't an emotionally stirring drama attempting to thrive at the next Academy Awards so one doesn't expect such scenes to drag on for hours, but audiences will largely fail to care one bit for anything that happens because of how the script chooses to gloss over it; this also leaves Brock's ex-girlfriend Anne as a character forgettable beyond all measure in the end. What's more of a shame is this isn't rushed through quickly to make Venom's appearance pop up even sooner - Eddie's transformation into the beastly badass still takes quite a while, and even when the symbiote makes his way inside, we're mostly just treated to a number of clumsy fight sequences starring an extremely hungry and goofy Tom Hardy beating up laughably incompetent agents with stretchy, slimy limbs beyond his control. This all links to how Venom simply can't decide on its tone for the most part - unsure if it wants to be comical and silly, riddled with admittedly funny but rather unfitting jokes and slapstick, or quite the opposite, with mild horror in some surprisingly unsettling sequences that establish a much darker tone. It's these jarring tonal shifts that make the script seem like an unfinished mess at times, with the story largely feeling like it was put on the back burner to boot. Venom isn't all bad. Tom Hardy's charms serve well, the action scenes do entertain now and then despite being overly noisy and somewhat repetitive, and the visual effects are as impressive as ever. It's just a shame the potential within this project is largely wasted; little thought and creativity is injected into it. There's some fun to be had, and audiences who don't look for such depth may be able to look beyond its many flaws, but the more it goes on the more it feels increasingly daft and dull, and a waste of a promising concept. It's even more of a shame Sony now wish to force their own shared universe out of all this.